These creative eggnog desserts will put everyone in the Christmas spirit. They are so fun and unique you’ll be the star of the party! 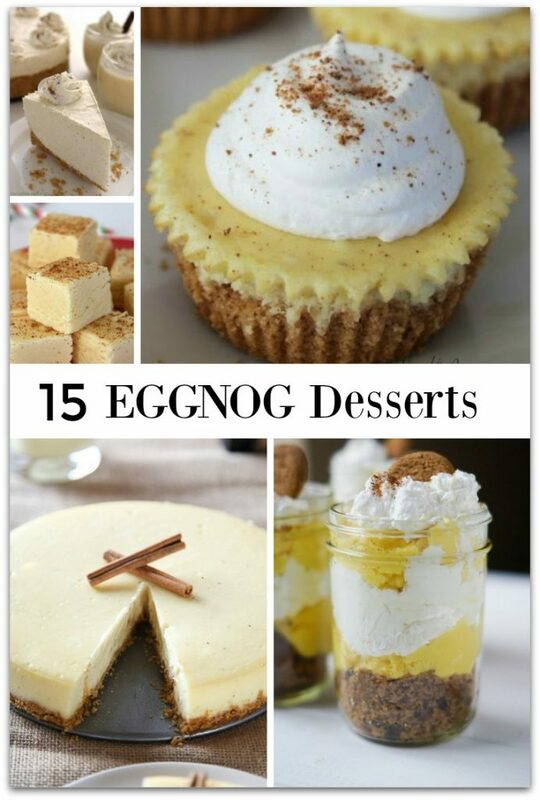 As much as I enjoy eggnog when the holidays roll around, I’ve never thought about making eggnog desserts. In fact, I’ve never even seen an eggnog dessert at a party, and I can’t figure out why! Nothing says the holidays like eggnog and sweet treats, so why not combine them to make a dessert that everyone will rave about? From cakes and pies to trifles and fudge, there are so many ways to enjoy eggnog instead of just drinking it from a glass! I don’t know what it is about eggnog. People either seem to love to drink it or claim they can’t stand the stuff. I have one daughter who will be drinking it from now until New Years, and another daughter who you couldn’t pay to drink it! But something wonderful happens when you add eggnog to a dessert recipe. No matter which camp you fall into, you’re sure to enjoy the rich taste of one (or more!) of these eggnog desserts that are perfect for your holiday celebrations. She had me at layer! Aren’t layer cakes so festive? A little more work, but so worth the outcome! I adore trifles, don’t you? And this dessert is actually really easy to make. No baking? I’m in! This way the cookies can be in the oven and I don’t have to worry about not having enough room. I haven’t tried this one but it sounds divine. I love rum cake, so this one is on my list to make soon! I love single serving desserts. So easy for a party! Pie is always a popular dessert for the holidays! I bet this one is delicious frozen, too! This is one of my favorites! Have you visited my Cupcake Crazy Pinterest Board? You’ll find a plethora of cupcake recipes there! Flans are a little more work, but oh so worth it. Perfect for a holiday dinner party! Biscotti is one of my favorite things with a cup of tea. And they are easy to make! This one sounds unusual, but sometimes those recipes end up being my favorite. I mean, chocolate anything right? We serve mini eclairs at almost every party we have, so this is on my list to make. Eggnog and rum go so well together, don’t they? I know my husband would love this one! Cupcakes are just so easy to serve at holiday gatherings. No forks, no spoons. I love hand held desserts. Doesn’t this on sound decadent? Perfect for a Christmas or New Year’s party! Looking for more Christmas recipes? Try these Chocolate Christmas Desserts or these Christmas Cookies everyone will love. Planning a special breakfast for Christmas? Check out these 10 recipes for a yummy Christmas breakfast. There you have it! The best 15 eggnog dessert recipes you’ll ever need! My personal favorite is the eggnog cheesecake – what is yours? Try to make a few and let me know what you think! Would a ready made graham cracker crust be ok? Sure! Graham cracker crusts would be delicious! Thanks for visiting and let me know how it turns out! You can use cheap vanilla wafers for crust too. Just crush them and add your cinnamon, sugar and butter like you do for a graham cracker crust. It is just as good and much cheaper. I get the cheapest vanilla wafers at Walmart! Oooh. That sounds delicious, Sharon!! Good idea, Angela! I’d love your recipe!